Why Start An Alpaca Farm? Welcome to Our Alpacas Website! Thank you for taking the time to visit our Alpacas site. You will see our website change over time as we try to improve to meet the needs of our visitors. We hope you will find the information you need, but if there is something you think we should add, please let us know. Our Alpaca Farm is for Sale! If interested please see this brochure. 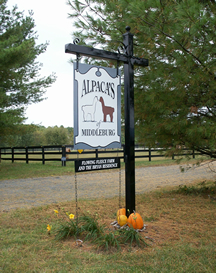 2003 � Alpacas of Middleburg. All rights reserved. Virginia Computer, IT support, and Design provided by LANTEC Systems, Inc.